Called "the eighth pillar of Russia" by St. John of Kronstadt, St. Matrona of Moscow (1885-1952), whose feast is celebrated today, is an extraordinary Saint of our times whose life should be known by all Orthodox as she is known throughout all of Russia. The blessed one’s funeral and burial marked the beginning of her glorification among the people as a saint. “After my death few people will visit my grave, only close friends, and when they die my grave will be abandoned,” the Blessed Matrona prophesized. 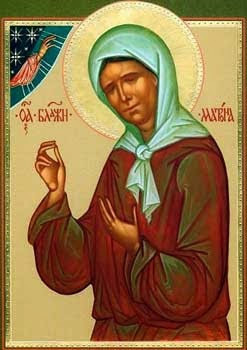 “But after many years people will hear about me and come in crowds for help in their sorrows and with requests for prayer for them to the Lord God, and I will help everyone and listen to everyone.” Matushka also said that everyone who trusted in her and in her intercessions before the Lord would be saved. 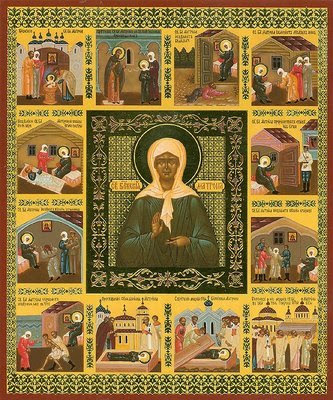 “Everyone who turns to me for help I will meet at their death, every one of them.” The Blessed Matrona’s memory is celebrated on April 19. Chosen by the Holy Spirit from thy swaddling clothes O blessed eldress Matrona, thou didst receive bodily weakness and blindness from God for spiritual cleansing, thou wast enriched with the gift of foresight and wonderworking and hast been adorned with an incorruptible crown from the Lord. Wherefore, we offer thee crowns of praise, in gratitude crying out: Rejoice O venerable mother Matrona, fervent intercessor before God for us! Rejoice, thou who wast filled with wisdom from God most high. Rejoice, thou who didst put to shame the wise of this age who are blinded in mind. Rejoice, thou who assuagest sorrow and affliction. Rejoice O venerable mother Matrona, fervent intercessor before God for us.